There were no major surprises at yesterday’s third and final stage from this year’s Eurosport Malta Challenge Marathon as Charlton Debono and Michelle Vella Wood produced the fastest times over the 21km route in St Paul’s Bay to seal their respective titles. Debono, of Gozo Athletic Club, again staved off the challenge of nearest pursuer Mario Grech (St Patrick’s AC) after covering the distance in 1:14.43 for an accumulated time of 2:26.18. Grech had to settle for second place for the third time in the three-day marathon as he was less than a minute behind Debono yesterday, 1:15.39, for an overall 2:29.43. Debono’s Gozo AC team-mate, Stephan Azzo-pardi, retained third place overall, coming home behind Grech in 1:19.05 for an aggregate time of 2:34.44. In the general classification, Azzopardi was followed by Matteo Redolfi (2:38.27), the first foreigner on the list. 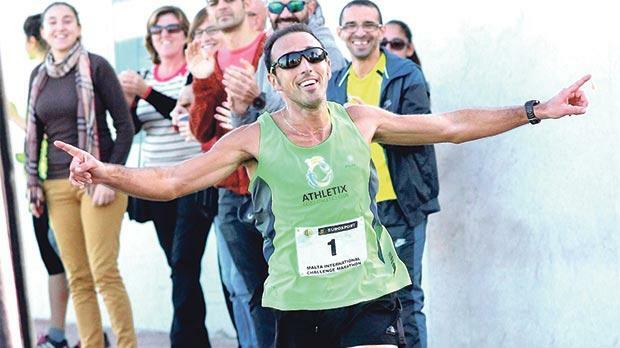 The Italian was unable to close the gap with Azzopardi as he was almost two minutes slower (1:21.02) over the longest leg in the marathon, organised by Birkirkara SJ, following Friday’s 16km opener in Siġġiewi and the short 5km run in Marsascala on Saturday. Vella Wood’s overall time was 3:05.50 following her 1:34.57 at the coastline 21km race. After all three legs, she was almost seven minutes faster than second-placed Karen Amato (3:12.36) with Italian Laura Milanese third overall in 3:13.19. In all, there were 95 men and 40 women who completed all three stages of the marathon. Meanwhile, Team Barry’s trio of Jonathan Balzan, Melvin Mifsud and Alexander Schembri were the clear winners of the Gatorade Relay Challenge. Their combined times produced an overall 2:33.45, more than four minutes faster than second-placed Mind Over Miles, a team composed of Alan Camilleri, Paul Formosa and Clint Aquilina.